Remember when gas was well above $3 per gallon? 2015 was a good years for motorists looking to save at the pump because it brought gas down to below $2 per gallon for half of the US, including Colorado. At the end of 2015, average gas prices in Fort Collins hovered around $1.88 per gallon. Now is the time to take advantage of low gas prices and invest the savings back into car maintenance. Sure, driving less aggressively and removing excess weight improves fuel efficiency, but making regular maintenance a priority multiplies your savings even more. Here are the most cost effective parts of your car to invest in to improve gas mileage. This car part measures air flow entering the engine, which affects the efficiency of the fuel injector, ignition system and transmission. When the mass air flow sensor becomes dirty, it sends inaccurate information, which makes fuel economy suffer. Replacing this part is an easy way to improve your car’s efficiency. Responsible for igniting the air/fuel mixture in the engine’s combustion chamber, spark plugs experience a performance dip as they get older. Replacing these parts helps the engine run cleaner and more efficiently. It’s best to have the spark plugs replaced at 60,000 miles if you have never had them replaced before. Scott’s Fort Collins Auto & Repair can perform this preventative measure to help you avoid a more expensive repair later down the road. This sensor monitors exhaust flow and sends the information to the engine computer, which adjusts the fuel injection level as needed. If the oxygen sensor is faulty and the data it produces are inaccurate, the fuel injector could cause fuel efficiency to plummet by as much as 40 percent. It’s best to have the oxygen sensor replaced at 100,000 miles or any time it’s deemed faulty. Oil helps reduce friction in the engine. To improve gas mileage by 1 to 2 percent, come to Scott’s Fort Collins Auto & Repair for regular oil changes. Follow the timeline recommended by the manufacturer to not only improve efficiency, but also prevent unexpected breakdowns. Air entering the engine is full of dirt and dust. The filter stops this debris from entering the engine, but it becomes dirty over time. By replacing the air filter every time you have an oil change at Scott’s, you improve your car’s fuel economy and acceleration performance. As one of the most basic components of any vehicle, the tires are responsible for providing traction and handling. If your tires are worn, misaligned or underinflated, your fuel efficiency suffers. Check your tire pressure once a month and keep them properly inflated to improve gas mileage by up to 3.3 percent. Then, have your tires aligned and balanced at Scott’s to help them last longer. When it’s time to have your tires replaced, turn to Scott’s for a wide selection of new tires at a great price. A car’s engine is a complex piece of machinery. The best way to catch problems before they become serious is to have your engine tuned up by the professionals at Scott’s. From cleaning to routine replacement to repair of faulty parts, an engine tune-up can make a big difference in your fuel efficiency and emission level. 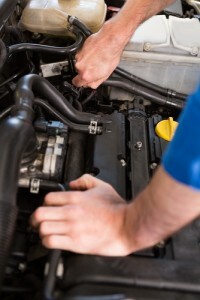 The average tune-up improves fuel economy by 4 percent. If you’re serious about improving gas mileage and helping your car last years longer, stop by Scott’s Fort Collins Auto & Repair today for an oil change, tune-up, tire balancing or any other maintenance task your car needs. You can also schedule an appointment online or call ahead at (970) 682-4202.